Arethusa, swamp pink, dragon's-mouth, wild pink, bog rose. Flowering in our region late May and early June. The genus Arethusa includes just the one northeastern North American species. 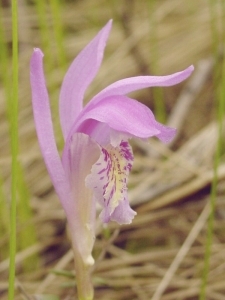 Although the northeastern Asian Eleorchis japonica, which is its closest relative, was formerly placed in Arethusa, both are now considered monotypic (having only one species) genera. Arethusa is a member of the orchid family or Orchidaceae. Though it is one of our most beautiful and alluring wildflowers, it is not often seen as it is rare in most of its range and it grows in wet floating mats of bogs and fens -- often at the water’s edge. Arethusa was a wood nymph in Greek mythology later transformed into a spring or fountain, the name probably given in reference to the plant’s very wet habitat. People who know this plant well have often been moved to write poetically about it. Henry David Thoreau likened it to a snake’s mouth. I particularly like Donovan S. Correll’s "...Arethusa is a true bog plant. Its typical habitat is in deep Sphagnum moss in company with ericaceous shrubs. Its beautifully colored flower is held primly erect by the rigid scape, and strangely enough it has the appearance of a fanciful little beast, with ears distended and lolling tongue, straining to recognize the intruder of its peaceful haunts." Morphology: Plant scapose, erect, glabrous, 3-8" tall at flowering, with the past season’s fruiting stalk occasionally persisting. Base with a broadly ovoid pseudobulb (corm) and a few fibrous roots. Leaf solitary and grass-like 2-10" long and 0.1-0.5" wide, developing after flowering. Immature plants producing only a leaf. Flower solitary or very rarely two, rose-purple with pedicellate ovary, curved in bud and asymmetric. Sepals lanceolate, dorsal sepal and petals connivent to form a hood over the column. Flower 0.6-1.2" high. Lip centrally bearded in lines, fragrant, nectariferous and splotched with yellow, white and purple. Capsule slenderly ovoid 0.6-1.1" long and triangular in section. Seeds minute and very numerous. 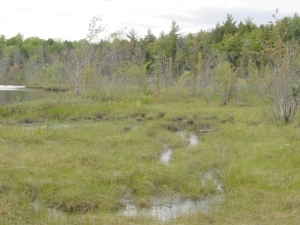 Habitat: Very wet Sphagnum-dominated open, often floating, mats of acid bogs and more often, poor to medium fens. Occasionally in rich fens and riverbank meadows. Usually loosely rooted in hummocks or wet low carpets of Sphagnum moss. Most often found near the water’s edge or on small islands or hummocks surrounded by water. The pseudobulbs are very attractive to voles and mice and a watery moat is its best protection. Life History: A short-lived to long-lived herbaceous perennial; much speculation and observations have been published, but few studies on its biology (except pollination) exist. Populations are known to greatly fluctuate in apparent size from year to year. It is injured by late frosts, which may be why it flowers little at some sites in some years. Several authors have conjectured that it may be short-lived and dependent on frequent seed production. Vegetative plants are exceedingly inconspicuous. It is undoubtedly mycorrhizal and seed germination and establishment depends on symbiosis with the right fungus or fungi. No data exist as to how long this life cycle takes. Arethusa is pollinated by bumblebees of the genus Bombus. The pollen is contained in two pollinia (pollen masses). Distribution: Arethusa occurs from Newfoundland west to southern Quebec and Ontario and Manitoba, south to eastern Minnesota, Wisconsin, Michigan and northern Indiana and Ohio, through much of Pennsylvania, New Jersey, New York, New England and the Maritime Provinces. In New York it is most abundant in the Ontario-Oneida lake plain. Endangered Species Status: Arethusa is listed as endangered or threatened in almost all the states and provinces where it occurs. In New York it is listed as threatened (G4 S2 T) and presently occurs at about 10 sites. In Connecticut it is believed to be extirpated (extinct). Habitat loss or alteration is probably the greatest factor in its decline. Land development, damming small lakes and ponds to make them larger, and the increase in beaver populations have been the greatest problems for wetland plant conservation in general, and for Arethusa in particular.